I work on a reward basis, its what its worth to you to have your item found and what you can afford. There will be a $30 call out fee to cover fuel. Parks, Yards, Beaches, Lakes, I also have a underwater detector and can search up to 25 feet depth in the water. My name is Don, I am equipped with some of the best equipment for land or water searches. My promise to you is that I will do my very best to reunite you with your lost treasures. Don was absolutely amazing! He found the first ring in less than 15 seconds and then found the other 2 rings in 45 seconds! We were so happy to find them, there were high fives and the beach party beside us gave us a big cheer. Way to go Don and “theringfinders.com”. I was heartbroken when I arrived home from the barn Thursday and discovered that my ring, which I thought was safely stowed in my travel bag, was missing. A search of the barn and my vehicle that night failed to locate the ring my husband had proposed to me with almost 30 years ago. The ring has huge sentimental value to us; we were young, had just bought our first house, and this ring represented the next step of our journey together. Mike found Don’s name on the Internet the next day and arranged for him to meet me at the barn on Saturday. Within 15 minutes of meeting, Don I was once again wearing my ring! I am not sure who was happier, me at having it back or Don at having found it for me! Don is a true gentleman and his joy in reuniting people with items precious to them is palpable. Thank you Don! I lost my wedding rings while while cutting the lawn with the ride on mower. 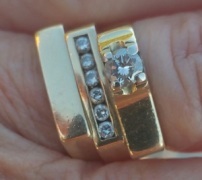 It was supper time that I noticed my wedding rings were missing, there is an engagement ring with ten diamonds in it welded to the wedding band. I felt really bad as I told my wife and saw the look of desperation on her face. We did go out and look with no luck which only made us feel hopeless. 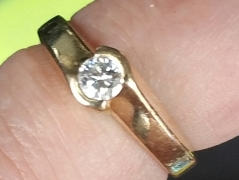 I then got on the web and searched for a ring finder and to my surprise I found one in my area [http://theringfinders.com/Don.Marshall/#ca-bc-victoria]. I did not have much hope for finding them as there was 6,000 square feet to cover and a lot of precut grass for them to hide in. Don showed up as promised and I signed his contract and I showed him where I started and where I finished. He did find the special hood hinge bolt off the tractor which gave me confidence that he would eventually find my rings. He found it on the second day of his search and I was very surprised that he found it an hour into his search. I was very impressed with his expertise and how quickly he found them. I just can’t thank him enough for his kindness. My wife came home just as Don was preparing to leave and was very elated to discover he had found them. 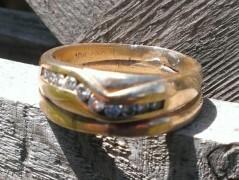 The crappy weld job was done by myself saving me the $250.00 the jeweler wanted to up-size them and weld them together. At the time I thought no one will see it anyway, was I ever wrong. It is my first time working with gold and I will try to do better the next time.